Lord Montagu Norman (the Governor of the Bank of England) in the right, Hjalmar Schacht (President of the Reichsbank and Minister of Economics in the Hitler’s government) in the left. There were key figures behind the plot: the Rockefellers, the Morgans, Lord Montagu Norman (the Governor of the Bank of England), Hjalmar Schacht (President of the Reichsbank and Minister of Economics in the Hitler’s government). The strategic plan of Rockefellers and Morgans was to subjugate Europe economically, saturate Germany with foreign investments and credits and make it deliver a crushing blow against the Soviet Russia so that it would be returned into the world capitalist system as a colony. Montagu Norman (1871 – 1950) played an important role of go-between to keep up a dialogue between American financial circles and Germany’s business leaders. HjalmarSchacht organized the revival of Germany’s defense sector of economy. The operation conducted by “money owners” was covered up by such politicians as Franklin Roosevelt, Neville Chamberlain and Winston Churchill. In Germany the plans were carried out by Hitler and Hjalmar Schacht. Some historians say Hjalmar Schacht played a more important role than Hitler. Simply Schacht kept away from spotlight. The Dawes Plan was an attempt following World War I for the Triple Entente to compromise and collect war reparations debt from Germany. The Dawes Plan (as proposed by the Dawes Committee, chaired by Charles G. Dawes) was an attempt in 1924 to solve the reparations problem, which had bedeviled international politics following World War I and the Treaty of Versailles (France was reluctant to accept it got over 50% of reparations). In 1924-1929 Germany got $2, 5 billion from the United States and $ 1, 5 billion from Great Britain, according to Dawes Plan. In today’s prices the sum is huge, it is equal to $1 trillion of US dollars. Hjalmar Schacht played an active role in the implementation of Dawes Plan. In 1929 he summed up the results, saying that in 5 years Germany got more foreign loans that the United States in the 40 years preceding WWI. As a result, in 1929 Germany became the world’s second largest industrial nation leaving Great Britain behind. In the 1930s the process of feeding Germany with investments and credits continued. The Young Plan was a program for settling German reparations debts after World War I written in 1929 and formally adopted in 1930. It was presented by the committee headed (1929–30) by American industrialist Owen D. Young, creator and ex-first chairman of Radio Corporation of America (RCA), who, at the time, concurrently served at board of trustees of Rockefeller Foundation, and also had been one of representatives involved in previous war reparations restructuring arrangement – Dawes Plan of 1924. According to the plan, the Bank of International Settlements (BIS) was created in 1930 to make Germany pay reparations to victors. In reality the money flows went in quite a different direction – from the United States and Great Britain to Germany. The majority of strategically important German companies belonged to American capital or were partly under its control. Some of them belonged to British investors. German oil refinery and coal liquefaction sectors of economy belonged to Standard Oil (the Rockefellers). FarbenindustrieAG chemical industry major was moved under the control of the Morgan Group. 40% of telephone network and 30% of Focke Wulf shares belonged to American ITT. Radio and AEG, Siemens, Osram electrical industry majors moved under the control of American General Electric. ITT and General Electric were part of the Morgan’s empire. At least 100% of the Volkswagen shares belonged to American Ford. By the time Hitler came to power the US financial capital practically controlled all strategically important sectors of German industry: oil refining, synthetic fuel production, chemistry, car building, aviation, electrical engineering, radio industry, and a large part of machine-building (totally 278 companies). The leading German banks – Deutsche Bank, Dresdner Bank, Donat Bank and some others – were under US control. On January 30, 1933 Hitler was named the Chancellor of Germany. Before that his candidacy had been thoroughly studied by American bankers. Hjalmar Schacht went to the United States in the autumn of 1930 to discuss the nomination with American colleagues. 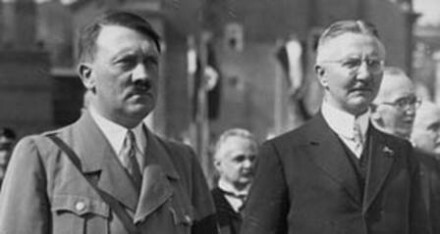 The Hitler’s appointment was finally approved at a secret meeting of financiers in the United States. He spent the whole 1932 trying to convince the German bankers that Hitler was the right person for the position. He achieved the goal. In mid-November 1932 17 German largest bankers and industrialists sent a letter to President Hindenburg expressing their demand to make Hitler the Chancellor of Germany. The last working meeting of German financiers before the election was held on January 4, 1933 in Kölnat the home of banker Kurt von Schröder. After that the National Socialist Party came to power. As a result, the financial and economic ties of Germany with Anglo-Saxons elevated to a higher level. Hitler immediately made an announcement that he refused to pay postwar reparations. It put into doubt the ability of England and France to pay off WWI debts to the United States. Washington did not object to the Hitler’s announcement. In May 1933 Hjalmar Schacht paid another visit to the United States. There he met with President Franklin Roosevelt and big bankers to reach a $1 billion credit deal. In June the same year HjalmarSchacht visited London to hold talks with Montagu Norman. It all went down smoothly. The British agreed to grant a $2 billion loan. The British offered no objections related to the Germany’s decision to suspend debt payments. Some historians say the American and British bankers were pliant because by 1932 the Soviet Union had fulfilled the 5-year economic development plan to make it achieve new heights as an industrial power. A few thousand enterprises were built, especially in the sector of heavy industry. The dependence of USSR on import of engineering production has greatly dwindled. The chances to strangle the Soviet Union economically were practically reduced to zero. They decided to rely on war and launched the runaway militarization of Germany. It was easy for Germany to get American credits. By and large, Hitler came to power in his country at the same time as Franklin Roosevelt took office in the United States. The very same bankers who supported Hitler in 1931 supported Roosevelt at the presidential election. The newly elect President could not but endorse large credits to Germany. By the way, many noticed that there was a big similarity between the Roosevelt’s “New Deal Policy” and the economic policy of the German Third Reich. No wonder. The very same people worked out and consulted the both governments at the time. They mainly represented US financial circles. Rexford G. Tugwell, an economist who became part of Franklin Roosevelt’s first “Brain, a group of Columbia University academics who helped develop policy recommendations leading up to Roosevelt’s New Deal,wrote that in 1939 the government failed to reach any success. There was an open sea till the day Hitler invaded Poland. Only the mighty wind of war could dissipate the fog. Any other measures Roosevelt could take were doomed to failure. (1) Only the world war could save the US capitalism. In 1939 the money owners used all leverage at their disposal to put pressure of Hitler and make him unleash a big war in the east. The Bank of International Settlements (BIS) played an important role during the Second World War. It was created as an outpost of American interests in Europe and a link between Anglo-American and German businesses, a kind of offshore zone for cosmopolitan capital providing a shelter from political processes, wars, sanctions and other things. The Bank was created as a public commercial entity, it’s immunity from government interference and such things as taxes collection was guaranteed by international agreement signed in the Hague in 1930. The bankers of Federal Reserve Bank of New York, who were close to the Morgans, Montagu Norman, the Governor of the Bank of England, German financiers: Hjalmar Schacht (President of the Reichsbank and Minister of Economics in the Hitler’s government), Walther Funk (who later replaced Hjalmar Schacht as President of the Reichsbank) and Emil Puhl – all of them played an important role in the efforts to establish the Bank. The central banks of Great Britain, France, Italy, Germany, Belgium and some private banks were among the founders. The Federal Bank of New York did its best to establish the BIS, but it was not listed as a founder. The US was represented by the private First National Bank of New York, J.P. Morgan and Company, the First National Bank of Chicago – all parts of the Morgan’s empire. Japan was also represented by private banks. In 1931-1932 19 European central banks joined the Bank of International Settlements. Gates W. McGarrah, a banker of Rockefeller’s clan, was the first BIS chairman of the board. He was replaced by Leon Fraser, who represented the clan of Morgans. US citizen Thomas H. McKittrick was President of the Bank during the war years. A lot has already been written about the BIS activities serving the interests of Third Reich. The Bank was involved in deals with different countries, including those Germany was at war with. Ever since Pearl Harbor the Bank of International Settlements has been a correspondent bank for the Federal Reserve Bank of New York. It was under Nazi control during the war years, no matter American Thomas Huntington McKittrick was the Bank’s President. Soldiers were dying on the battlefields while the leadership of BIS held meetings in Basel with the bankers of Germany, Japan, Italy, Belgium, Great Britain and the United States. There, in the Swiss offshore zone, it was all peaceful, the representatives of belligerents quietly worked in the atmosphere of mutual understanding. Switzerland became the place where gold seized by Germany in different corners of Europe was transported to for storage. In the March of 1938, when Hitler captured Vienna, part of Austrian gold was transferred to BIS vaults. The same thing happened with the gold of Czech National Bank (48 million USD). As the war started, the flows of gold poured into the Bank of International Settlements. Germany got it from concentration camps and as a result of plundering the wealth of occupied countries(including whatever belonged to civilians: jewels, gold crowns, cigarette cases, utensils…). It was called the Nazi Gold. The metal was processed into ingots to be stored in the Bank of International Settlements, Switzerland, or outside Europe. 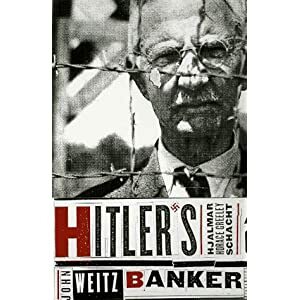 Charles Higham in his Trading With The Enemy: An Expose of The Nazi-American Money Plot 1933-1949 wrote that during the war Nazi transferred $378 million into the accounts of Bank of International Settlements. A few words about the Czech gold. The details surfaced when after the Bank of England’s archives were declassified in 2012. (2) In the March of 1939 Germany captured Prague. Nazi demanded $48 million of national gold reserves. They were told that the sum had already been transferred to the Bank of International Settlements. Later it became known that the gold was transferred from Basel to the vaults of Bank of England. Upon the command from Berlin the gold was transferred to the ReichsbankBIS account. Then the Bank of England was involved in transactions done upon the orders of Reichsbank given to the Bank of International settlements. The commands were retransmitted to London. There was collusion between German Reichsbank, the Bank of International Settlements and the Bank of England. In 1939 a scandal broke out in Great Britain because the Bank of England executed the transactions with Czech gold upon the commands coming from Berlin and Basel, not the Czech government. For instance, in the June of 1939, three months before the war between Great Britain and Germany started, the Bank of England helped Germans to get into their accounts the amount of gold equal to 440 thousand pounds sterling and transfer some gold to New York (Germany was sure that in case of German intervention into Poland the United States would not declare war). The illegal transactions with Czech gold were implemented with tacit approval of the government of Great Britain which was aware of what was going on. Prime Minister Neville Chamberlain, Chancellor of the Exchequer Sir John Simon and other top officials did their best to hide the truth, including outright lies (the gold was returned to the lawful owner or had never been transferred to Reichsbank). The recently declassified materials of Bank of England reveal the truth and show that the government officials lied to cover up themselves and the activities of the Bank of England and the Bank of International Settlements. It was easy to coordinate the joint criminal activities because Montagu Norman, the head of Bank of England, served as the chairman of the board of Bank of International Settlements. He never made secret of his sympathy for fascists. The Bretton Woods Conference, formally known as the United Nations Monetary and Financial Conference, was the gathering of 730 delegates from all 44 allied nations at the Mount Washington Hotel situated in Bretton Woods, New Hampshire, the United States, to regulate the international monetary and financial order after the conclusion of World War II. The conference was held from 1 to 22 July 1944. All of a sudden the issue of the Bank of International Settlements hit the agenda. It was reported that the bank collaborated with fascist Germany. Leaving many details aside, I’d only mention that with great difficulty (some US delegates opposed the motion) the delegates reached an agreement to close the BIS. The decision of international conference has never been enacted. All the discreditable information related to the BIS wartime activities was classified. Today it helps to falsify the history of the Second World War. Finally, a few words about Hjalmar Schacht (1877-1970) who served as President of the Reichsbank and Minister of Economics in the fascist Germany’s government. He was a key figure controlling the economic machine of Third Reich, an extraordinary and plenipotentiary ambassador representing Anglo-American capital in Germany. In 1945 Schacht was tried at Nuremberg to be acquitted on October 1, 1946. He got away with murder. The same way it happened to Hitler. For some unexplained reasons he was not in the 1945 leading wartime criminals list. More to it, Schacht returned to his profession like if nothing happened and founded Schacht GmbH in Düsseldorf. This detail may go unnoticed, though it serves as another testimony to the fact that Anglo-American “money owners” and their plenipotentiary representatives in Germany prepared and, to some extent, influenced the outcome of the Second World War. The “money owners” want to rewrite the history of the war and change its results. This entry was posted in International Law and Nuremberg Precedents, ANGLO-AMERICAN GENOCIDE, IMPERIAL HUBRIS AND HYPOCRISY, ANGLO-AMERICAN EUGENICS AND NAZIS, FASCISM AND IMPERIALISM, 4th Media, MSM MANIPULATION, nuremberg precedents, IMPERIAL SOCIAL SYSTEMS ENGINEERING. Bookmark the permalink.